• WE CAN SMOG ANY CAR! Colton Smog Test Only is an official STAR Test Only Center certified by the State of California. We are a STAR Test Only Center smog checking service, which means we are authorized by the State of California to perform both Regular and Test Only smog inspections. We are not allowed to perform any smog repairs. Our STAR Test Only Center center's main obligation is to perform a non-bias and accurate smog inspection. 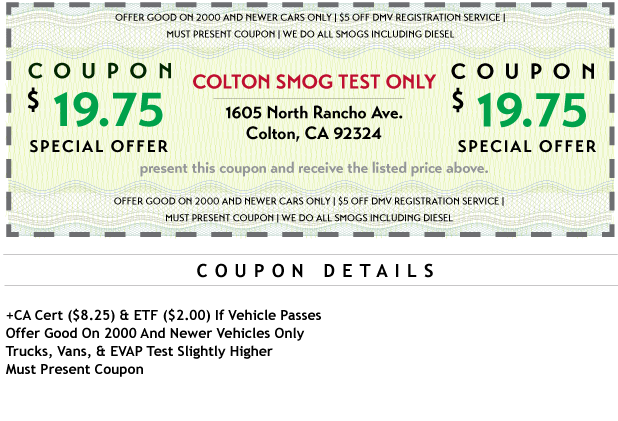 Colton Smog Test Only STAR Test Only Center smog station is certified to inspect all DMV required vehicles. Our reputation has been our trademark and is a result of honesty, integrity, and personal attention to each and every one of our customers. If your registration renewal states your vehicle requires a smog check at a STAR Test Only Center station you may bring it to our shop. We'll be more than happy to take a look and give you an honesty inspection. Small or large, your request will be met with expert advice, individualized attention, and innovative solutions. Thanks for choosing Colton Smog Test Only! • We send your smog certificate info to DMV and AAA within seconds of when you pass. • As you leave, ask one of our service men for directions to AAA. • Walk into AAA with your registration info, tell them your smog check results are online and you want your vehicle registration sticker. They know the rest; pay with cash or check (no debit or credit cards). • Put the sticker on your license plate - you're done!